Hello everyone. 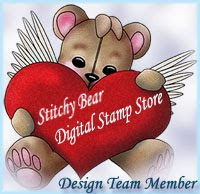 For today i have very simple card for Sweet Pea Stamps. Image here from Plate #248 by Ching Chou Kuik. As always you can have Rubber stamp or Digital image. I colored image with Prisma Pencils, and inked background. Sentiment here also from Sweet Pea Stamps. To make beautiful lace look around my image i used MS punches. I used Yellow Mirror cardstock to layer with image. I hope you like it. Beautiful card Nataliya, love her hair and the great layout. Hello sweet Nataliya, this is a gorgeous card, your coloring is fantastic, love it, the frame is beautiful to frame her,love the background papers, love the yellow, it make your beautifully colored image pop. Thanks for sharing and have a wonderful weekend.. Very pretty Natalyia. The image is so sweet and I love her hair color!